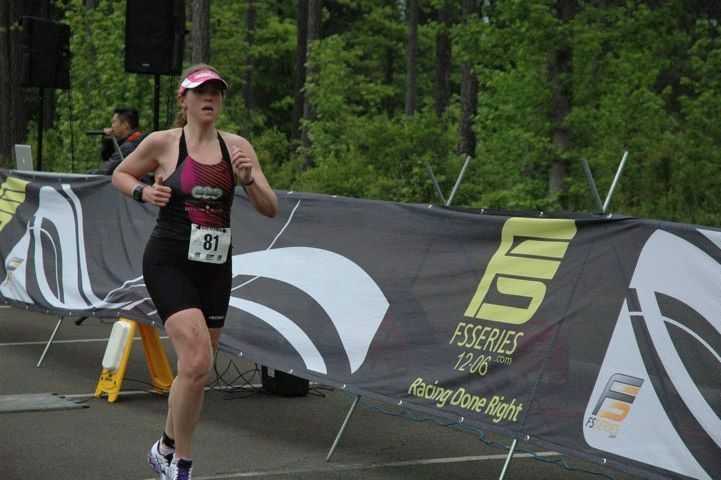 Last year I raced in my first ever duathlon. I had a great time at that race and knew that it would be a repeat event for me. 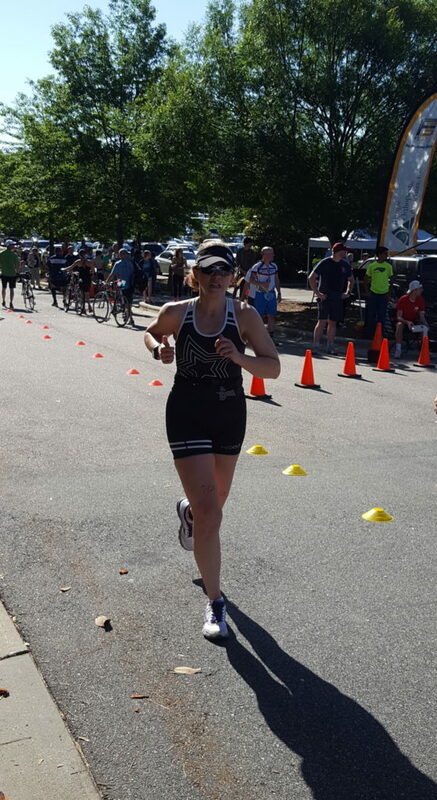 They offer both a long course and short course option, but with my training for Raleigh 70.3, the obvious choice was long course. With the race taking place on May 14, it is actually a great lead up to the 70.3 on June 5. 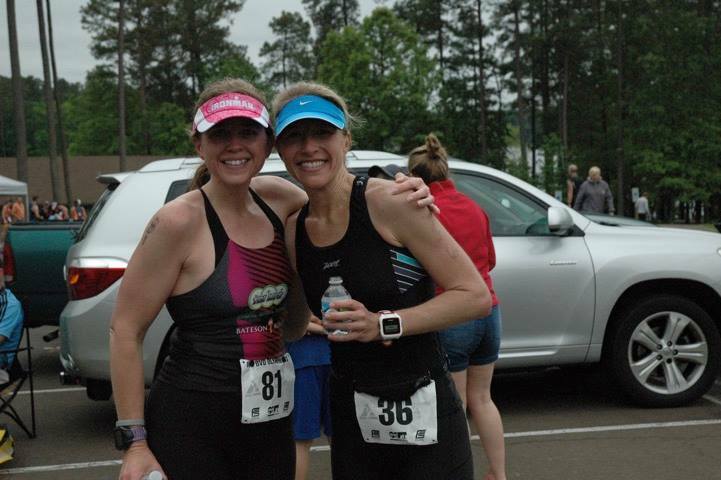 Two of my training partners also raced, so even better to have friends out on the course! The interesting twist to the race this year is that it served as the USA Triathlon Long Course Duathlon National Championship for 2016. That would bring in athletes that would not normally be participating in this local event and I expected them to be great racers as well! The race took place in Cary, which is just down the road. The venue was located about 35 minutes from home, but had an early start of 7:00am. That meant an alarm of 4:20am…ouch! It was a tiny bit chilly race morning, but that really meant that it was going to be a great weather day for us! We arrived around the time I planned and was able to park super close to transition. I love when that happens! All the typical pre-race stuff happened as well as connecting with my friends. 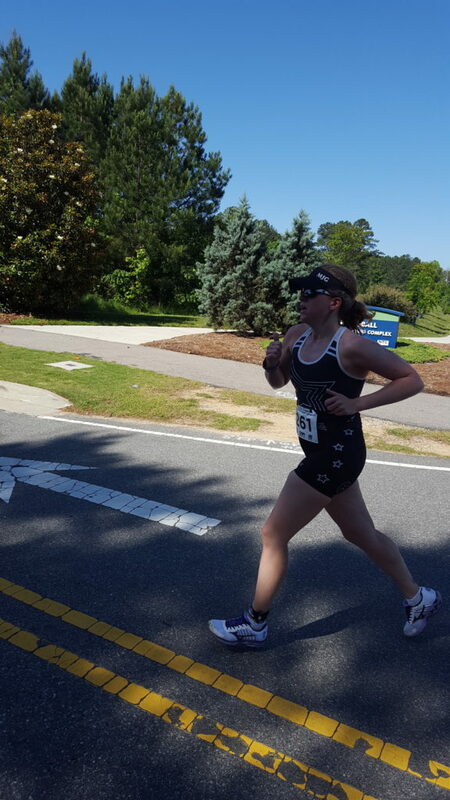 The one big difference about a duathlon is that I do a run warm-up and some dynamic stretches beforehand….all not typical with a tri! The long course guys were scheduled to start at 7:00am with the ladies starting 7:04am. The short course began at 7:15am. The event was a 5 mile run/30 mile bike/5 mile run. The run was an out and back with the majority taking place on residential sidewalks and greenways with “small rolling hills (as the course description read)”. 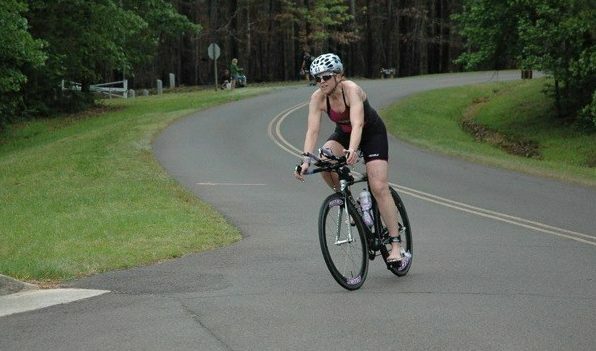 The bike course included “fast, flat, rolling and climbing sections with multiple view of Lake Jordan”. Part of the course included a two-loop section which passed a local strawberry farm. I have ridden all these roads before, but not frequently. However, the course is generally the type you would expect for our area. The run started and I did not have a specific plan, but mile #1 is generally my slowest mile and I gradually build. I can say this is the case for me about 95% of the time. Well, this day proved to be different. Mile #1 was an 8:14 split, my fastest mile of the day! Still not sure where that came from, but I didn’t really feel like I was pushing that hard at the beginning! I did settle down into a more likely race pace for myself, but I have to admit that I was glad to have the first split in my pocket! Overall, I was happy with the first run. Onto the bike….the one thing I did, which I planned to do, even though I don’t prefer it, is to wear socks on the bike. I always bike barefoot unless it is a cold day. Otherwise, I just don’t like it. However, since I do wear socks on the run, it only made sense to wear them for the leg in between the running! I did have a little bit of a hard time getting my shoes on with the socks….that may sound weird, but that’s that. Too long in T1. Tony was not there to push me in transition (as he typically does) because he had run out to see me on the bike course. There was a place he could see me twice, but that involved him getting in a four-mile run and then back! I always love to see him out, so I was glad he decided to get in some run training as I was racing! I had my nutrition and hydration plan which would all occur on the bike. There were aid stations on the run, but that served as only a little cup of water a couple of times. I started out hard on the bike but then just tried to ride smart. The plan was to take advantage of the downhills and the flats and work the gears on the uphills. I was eating and drinking well and took one bottle of water at the one handoff on the bike course. Within the last few miles I really started to notice the fatigue in my legs. Maybe I pushed too hard?!?!? Do I back off? Well, I didn’t really. I would just endure the second run as best as I could. It would not be easy anyway, so I just kept it going. Into T2 and I saw Tony (he was back from his run). This transition was much better than T1. As I ran out he asked me how I felt…”my legs are shot” was my response. That first mile of run #2 was not easy. I just told myself that the first miles are never easy and after I found my rhythm I would loosen up. This was the case. It was still a challenge throughout, but I was pleased with how I mentally and physically hung in. I saw the guys on my way out as they were headed back in. Racing with friends is the best! Knowing I had a solid first run, I was really hoping for a sub 9:00 pace for the 2nd run. As I saw my Garmin laps tick off, I knew I would not achieve that. However, my last mile ended up at 8:37 pace, so overall my 9:04 pace for the second 5 miles was exciting after all! Very close! The finish line felt great (doesn’t it always) as I gave it all out there. My Garmin distance on the bike is pretty spot at 29.6 on I think. (My two training buddies had 29.69 and 29.73). The race results use a 31 mile distance, so unfortunately that 20.1 mph average speed in my official results is a bit inflated! I find it very interesting to look at my overall category placements in a duathlon. Unlike a tri, you are running twice. While my first run was my fastest, that was my lowest placement. I guess more people went out hard and had less in the tank that I did when you look at my placement for the second run. Slower pace than the first, but higher placement overall. Hummmm…. Post-race there was plenty of socializing and hanging out. There were good choices for food, and while I had a bit, we all had planned lunch out post-race, so I knew a good burger was in store for me. Once again, this was a great event. 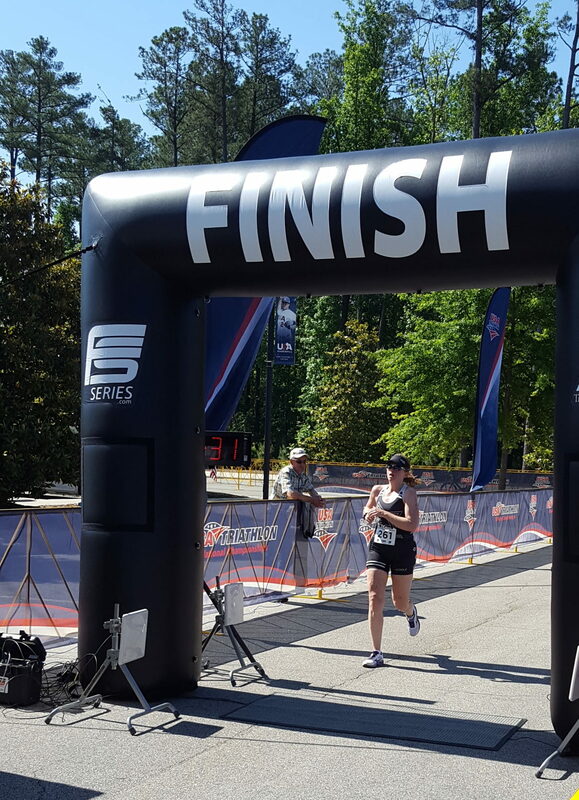 It was fun to race a duathlon again and it also served as a great lead up to Raleigh 70.3. 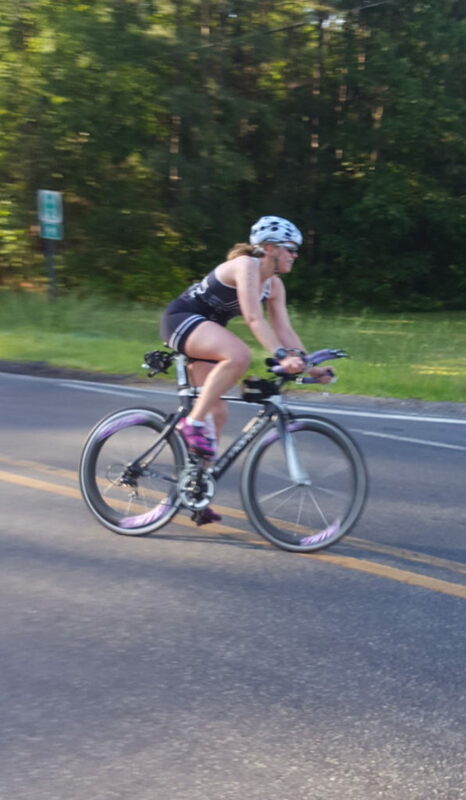 As I mentioned in my last post, I was uncertain if my race season would start on April 30 with the Beaverdam Olympic Tri. I was hoping that it would, but since I am highly impartial to cold water swims, I had to determine if the water would seem to warm up enough for my liking. Generally, I think I am NOT ok with less than 70 degrees. That makes me whatever that makes me, but I am a Southern girl and cold and I are not besties! We were able to have some warm days (in the 80s) and that translated to the lake temperature rising. 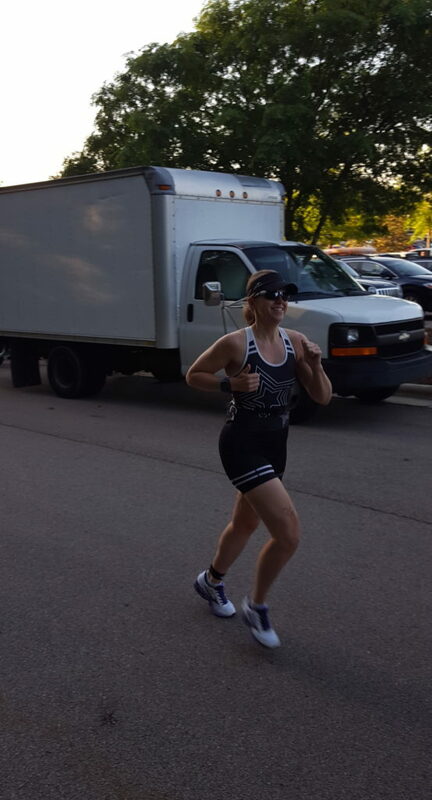 I signed up on the Monday prior to the Saturday race (most of the week had temperatures forecasted in the 80s) and I knew of a few people that had already ventured out for their first OWS, so I was taking their word that “it was not that bad”! In preparation for race day, a group of us did complete an early morning OWS on the Wednesday prior. I was ready to get this first lake swim under my belt for the season. My wetsuit is sleeveless (this I what I am most comfortable in) and I believe the water temperature was around 68 /69 degrees. Honestly, it was not horrible, but it was still cool enough that I never felt like I warmed up. We did an out and back which totaled a bit over a mile and at the turn around, I was still chilled. I seem to have trouble getting deep breaths when I swim in cool water. I definitely experienced that and had a less than stellar OWS season opener. 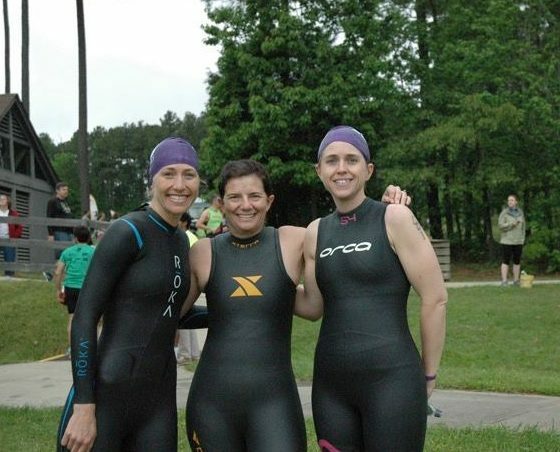 I am very glad that I did it and it was awesome to have a good group of teammates to meet for the swim. 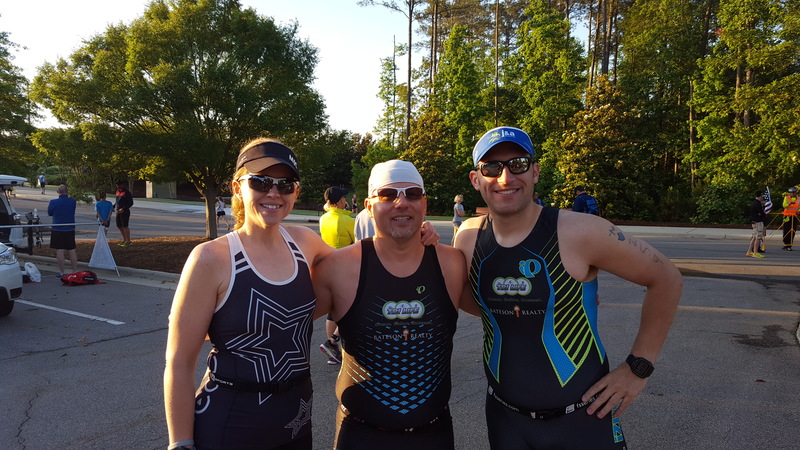 So, the Beaverdam Olympic Tri takes place in Wake Forest (just one town over from Raleigh) and the event is held at one of the Falls Lake Recreational areas. It is where I prefer to do most of my OWS training, so I am very familiar with the area. I have never done this race, but it was one that I had been wanting to do and since it occurred a week or two later this year, I was able to give it a go. The gates did not even open to the park until 7:15 with a start time of 9:00. There was also a sprint distance that started at 9:30. This later start was nice in that the alarm did not have to be set crazy early!! When we left home Saturday morning there was light rain, but nothing on the radar, so I was hopeful that it would clear very soon (which it did). We arrived at the race venue around 7:40 (about a 25 minute drive from home) and parking was very easy and convenient. It was just a short walk to transition to set up. 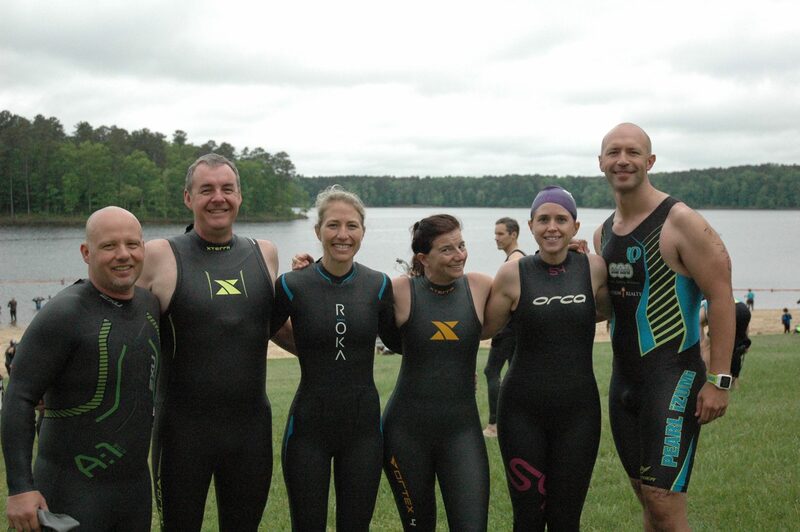 There was a good number of folks from the tri team racing which always provides an extra bit of excitement to the day. Everything was well marked and easy to navigate….my only suggestion for improvement would be to add more space between the bike racks as it was a tight squeeze. After getting body marked, my chip and transition set up, the crew started coming together for pre-race conversations. It was in the upper 50s and it seemed like it was going to be a good day to race. Even better, it was announced that the water temperature was 73 degrees! YAY!! Because my Wednesday OWS was not a good one, I had decided that I would get in a warm up swim. Even though I knew it was warmer, I wanted to get as comfortable as I could before it was go time. Well, I was super glad that I did. The water felt so much better… what a pleasant surprise! As the time approached, it was great to have some female teammates to hang with as we prepared for our swim time (the guys were divided into two separate groups before us). Before we knew it, it was go time! I felt like I got a great start and pretty much continued with the momentum. There was one point for a very short time that I wondered if I went out too hard (not typical), but the feeling passed. With only one OWS so far, I have not had sighting practice this year (which continues to be one of my weaknesses), but I felt like with only a few exceptions, I was on conservative path for my swim (and not swimming to much off course). Overall, the 1500 meter swim was good, I found my rhythm, swam until my hand hit and sandy bottom I got it done! The run up to T1 was a bit uphill and Tony ran with my the entire way (it was a smaller race, so this was not a problem nor did it interfere with anyone else). My bike was racked on the end next to the fencing, so he was able to stand outside of transition and talk to me while I did my thing. My transition time was good. The bike course exits the park and proceeds out through the county. As per the race description….” The course will feature fast flats, small climbs, and rolling terrain”. A majority of the route I had ridden before so it was familiar. The first few miles on the bike I was feeling my quads, but I focused on getting some good hydration early on and settling in…which I did. Traffic was not too bad. There was only one intersection where I had to pause longer than I would have liked, but the officer quickly told me “YOU DON’T STOP”! It was just more congested that I would have liked and wanted to make sure I made a safe decision. The sheriff deputies at this event were really great (there was one that even clapped for me)!!!! I feel like I rode the 24-mile course fairly well and it was about what I expected. T2 was ok. I had to stop for a few seconds as I was about to go down my row to re-rack my bike because there was a little traffic jam (that’s why I mentioned the racks were too close together). I always take time to put on socks in T2 which add a little more time, but it is a necessity for me. 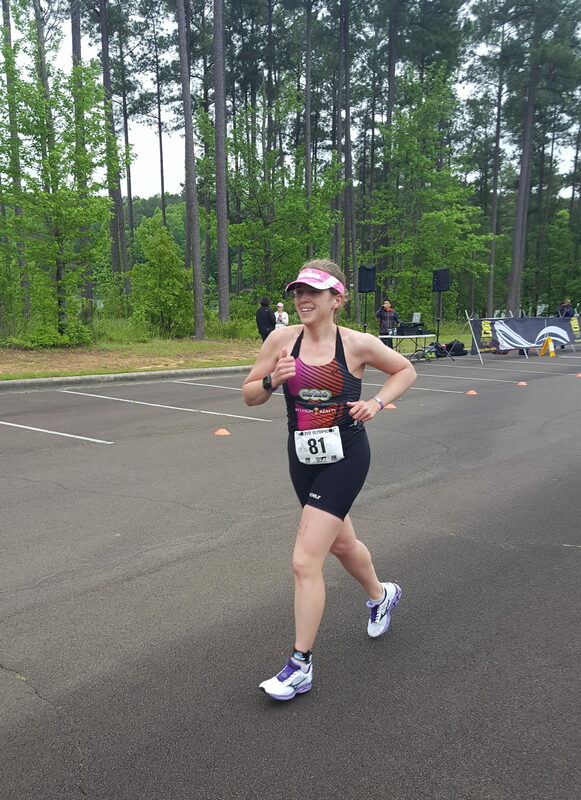 I grabbed my visor and race belt and put those on as I was running out of T2. Once again, Tony was just by the fence talking to me while I transitioned. He always pushes me to work toward a faster T time. As per the race description for the 6.2-mile run…” The run course will be totally contained in the Beaverdam Recreation Area. The course will be a 2 lap out and back. The run will have a rolling design with 2 aid stations. The first aid station will be at the 1st lap turnaround and the 2nd aid station will be at the out turnaround.” This was a perfect description! As is typical for me, my first mile ended up being my slowest, but when I saw the lap time during the run, I was happy with how I started. Throughout the run, my legs were definitely feeling the “rolling design”, but I pushed on the downhills and flats. Because of the course design and there were lots of teammates there, I saw lots of friendly faces the entire time. Our team cheerleaders were at the turn around which is always a boost! Overall I pushed on the run…maybe too hard, but I just figured I would put it all out there. Since this was a last minute sign up, I really didn’t consider specific goals that I wanted to aim for. That is unusual for me, since I typically set out specific goals when I race. When I was pushing on the run, it was not because I was gunning for a specific time. I knew my swim time, I knew my bike average speed and knew each of my run lap times, but I didn’t know overall run time. I didn’t have an overall goal, but I pushed to finish strong. I ended up sprinting to the finish line because there was another girl right there. I didn’t think she was in my age group and I guessed she was doing the sprint, but I didn’t know any of that for sure, so I wanted to hit the line before her, just in case. Crossing the finish line is always so wonderful. My biggest supporter was right there to watch me finish and he knew as well that I had a good day. 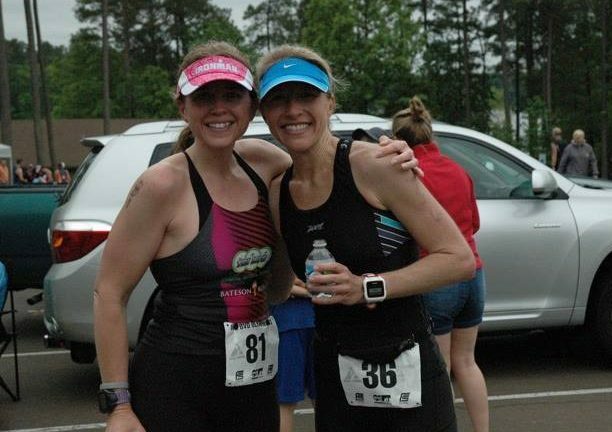 I started to look at my Garmin for overall time….I realized that I lapped my Garmin when I finished, but I hadn’t stopped it. I had about 51 seconds more to my Garmin time. However, since Tony timed me, he was able to tell me right away that my time was 2hours 47minutes! REALLY?!?!? I was thrilled!!! This was only my third Olympic distance (odd that before this race I had done more 70.3s than Olys). My first Oly was back in 2011 when I was over the 3-hour mark. 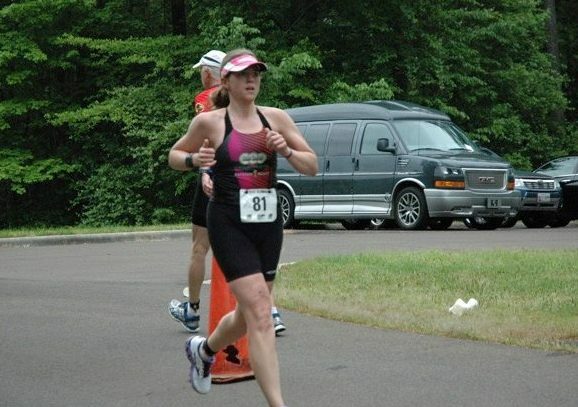 Last September I raced my second and had a huge new PR of 2:52:04 and placed first in my age group out of 19. This race I was able to secure yet another new PR by 4.5 minutes. 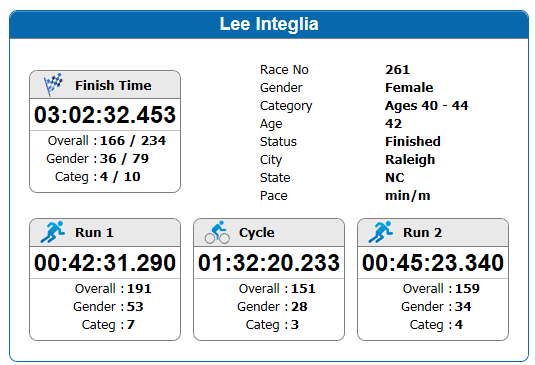 You can see how my results fell overall in my age group. This race had some stellar competition…especially the runners! Gamin Times: Obviously “unofficial”, but it is important to me because it always gives me a better gauge of my true swim time. Most races the swim “time” captures some part of transition, based on where the timing mats are placed. 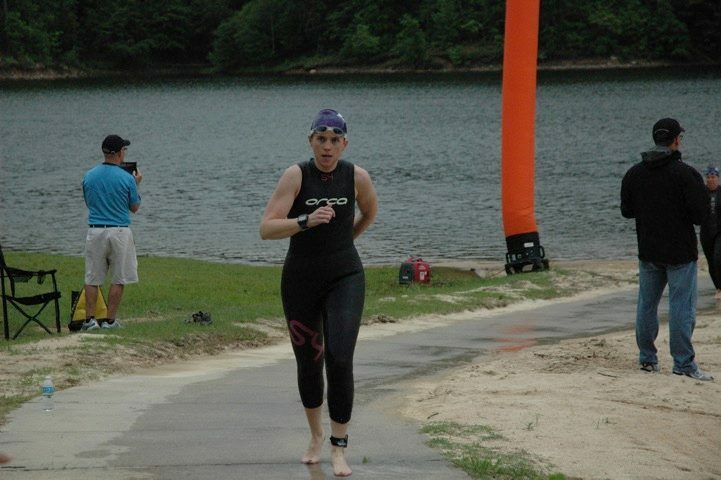 I am always very diligent about lapping my Garmin as soon as I stand up being done with the swim. This has proven to be a better tool for my swim analysis. All in all it was a great day. 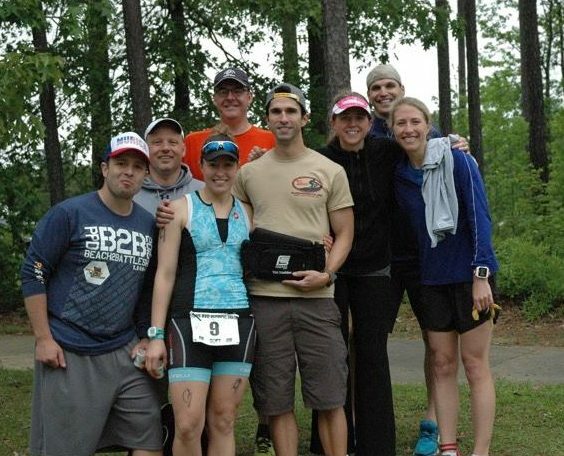 We had several from the team that took a podium spot in their age group. I am glad I raced!! Many of us joined together for a post-race lunch which was a lot of fun. The afternoon consisted of a GREAT nap and a quiet evening with dinner in (except for a quick trip out for my typical race day treat of a milkshake)! This was a great way to kick of the tri season and it was even better to share it with great teammates!